Sherlock – The Hounds of Baskerville. 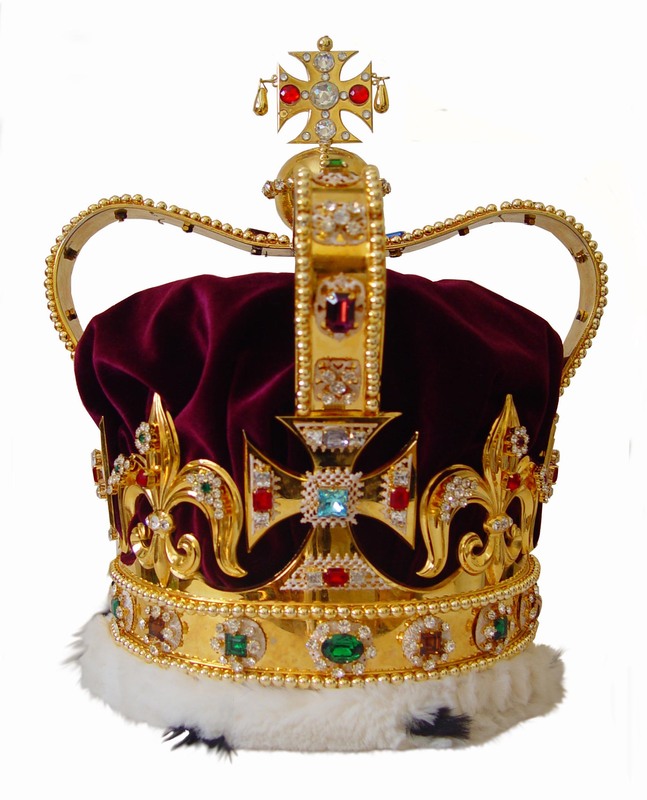 This crown is one of the most important of all the Crown Jewels. It is the crown which is used at the moment of coronation. The original, medieval crown was melted down by the Parliamentarians during Oliver Cromwell’s rule. When the monarchy was restored on 29th May 1660, new regalia had to be made before there could be a coronation. A copy was instructed to be made. 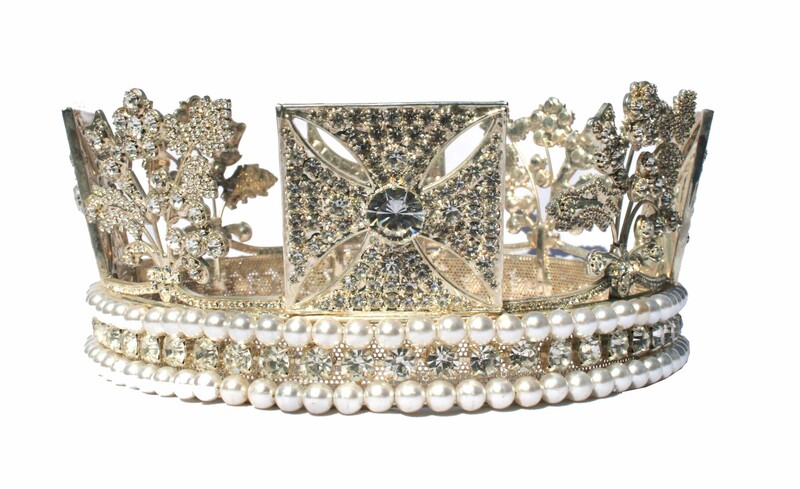 It was to be used at the actual moment of crowning, but never worn again during the reign. The crown is made of solid gold. Up until George V’s coronation it was set with paste stones and enamel mounts. In 1911, for the coronation of George V, the crown was permanently set with semi-precious stones, and the imitation pearls were replaced with gold beads, which were plated with platinum. Later the platinum plating wore off revealing the gold beads. The crown has a velvet “Cap of Estate” and a faux ermine border. Our replica is made as near as possible to the original. Great importance is paid to every detail of the crown. It is made of base metal, gold plated and set with best quality crystal stones. The Imperial State Crown is the most magnificent of all the Crown Regalia. It was made in 1838 for the Coronation of Queen Victoria, and then altered for the Coronation of George VI in 1937 and Elizabeth II in 1953. It is usually worn at the end of the coronation ceremony, when the newly-crowned monarch departs from Westminster Abbey. Although the crown is modern in design, it is set with very ancient gems. The Black Prince’s Ruby is set into the central panel of the crown. The ruby looks like a clot of congealed blood. It is one of the most interesting and admired gems in existence. Its history is mired in murder and bloodshed. It was first heard of in the mid-14th century, by which time it was already many centuries old. It was then owned by the Moorish Prince of Granada who was murdered by Peter of Castile (also known as Don Pedro the Cruel), who coveted the gem. Don Pedro then gave it to the Black Prince as a token of gratitude for his assistance at the Battle of Navarrette in 1367. On the Black Prince’s death, the ruby was passed down to his son Richard II, but it soon figured again in battle, this time in Agincourt in 1415, when Henry V wore it in his coronet. Seventy years later in 1485, Richard III wore it in his helmet at the Battle of Bosworth Field, where he lost the throne and his life. Legend has it that the ruby was concealed beneath a hawthorn bush. It is said to have been retrieved and placed on the head of the victor, Henry VII. Under Oliver Cromwell, the jewels were melted down and destroyed. The Black Prince’s Ruby was bought by a jeweller who resold it to Charles II after the Restoration in 1660. The Stuart Sapphire was set into the front of the crown by Charles II after the Restoration. It is now set into the back of the crown. This jewel has a rather romantic history. James II took it to France with him in 1688, when he was deposed, and for the next 100 years it belonged to the Stuarts. It was inherited by Henry Benedict Stuart, the Cardinal Duke of York, grandson of James II, and remained in his possession until 1807. The Stuart Sapphire was subsequently brought back to England on behalf of its rightful heir, George III. When, in 1810, the latter was declared unfit to reign, the treasure was inherited by his son, George IV. In 1814, he in turn gave it to his daughter, Princess Charlotte of Wales. Charlotte died in childbirth at the age of 21, whereupon George IV took back the jewel and presented it to one of his mistresses, the Marchioness of Conyngham. Lady Conyngham graciously returned the jewel when the king died in 1830. In 1838, Queen Victoria had the sapphire set into her Imperial State Crown, at the front, below the Black Prince’s ruby. It was reset to the back of the crown in 1909 to make room for the Second Star of Africa, then the second largest diamond in the world. 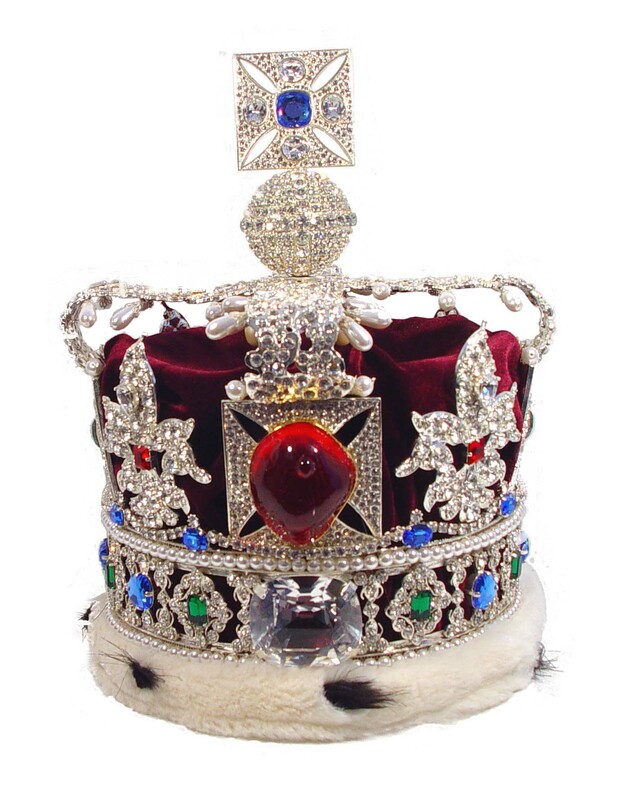 The Cullinan diamond decorates the brow of the Imperial State Crown, just below the Black Prince’s Ruby. It was found in Africa in 1905, weighing 3601 carats – the largest diamond in the world. Later the Transvaal Government made a gift of the enormous stone to Edward VII who had it cut into several pieces. The largest piece, known as the Cullinan I (The Star of Africa) was set into the King’s sceptre, and the second largest – the Cullinan II (Second Star of Africa) was mounted to the front of the Imperial State Crown. St. Edward’s sapphire is set into the Maltese Cross at the top of the Imperial State Crown. It is named after Edward the Confessor, who is said to have worn the stone in his ring. Legend has it that King Edward revered St John the Evangelist; he was also known for his generosity towards the poor. One day, on his way to Westminster, the king was accosted by a beggar and, having no money on his person, gave him the ring. Many years later, two pilgrims from the Holy Land returned the ring saying that it had been given to them by an old man who claimed to be John the Evangelist. The old man said he had received the ring as a gift from a King, many years earlier, when in beggar’s guise. He sent thanks to the king for his kindness, and said he would meet him in Paradise in six months’ time. Edward died exactly six months later, in 1066, and was buried with the recovered ring on his finger. When his coffin was opened two hundred years later, his body was found to be perfectly preserved. The Abbot of Westminster slipped the ring off his finger and it has remained part of the Crown Jewels ever since. 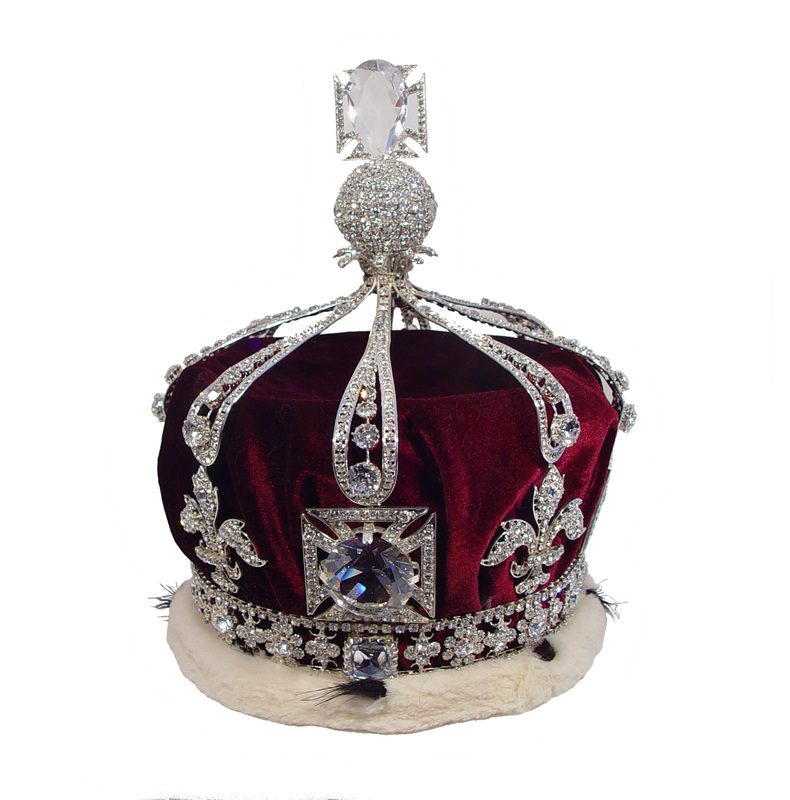 In addition, the Imperial State Crown also contains 4 rubies, 11 emeralds, 17 sapphires, 277 pearls and over 3000 diamonds. The Imperial Crown of India was made for King George V to wear at the Delhi Durbar in 1911, when he was acclaimed Emperor of India. A special crown had to be made as the Imperial State Crown cannot be taken out of England. The Imperial Crown of India will probably never be worn again and its significance is now purely historical. The crown has eight half arches which spring from the cross pattee and fleur-de-lis, and it contains a remarkably fine emerald, a number of other emeralds, sapphires, rubies and over 6000 diamonds which were sent over from India. The Imperial Crown of India is housed in the Jewel Hall of the Tower of London, and displayed on its own, away from the State Crowns. It is not part of the British Crown Jewels. King George and Queen Mary travelled to Delhi for the Durbar service, during which they were to be proclaimed Emperor and Empress of India. The King was not crowned at the service because the Archbishop of Canterbury did not think it suitable for a Christian religious service to take place in a predominantly Hindu country. Therefore, the King was already wearing the crown when he entered the arena where the Durbar was taking place. The crown has not been worn by any sovereign since. Queen Mary’s Crown is set entirely with diamonds and crystals. It was made for Queen Mary when she was crowned Queen Consort with George V on the 22nd June, 1911. Queen Mary’s crown originally contained the Third Star of Africa in the cross pattee which surmounts the heavily jewelled monde and the Fourth Star of Africa in the band. Both these diamonds were cut from the Cullinan I diamond, which is the biggest diamond in the world. Both diamonds are the personal property of Queen Elizabeth II and are not part of the Crown Jewels. They are known as the Lesser Stones of Africa and were mounted in such a way that they can be removed and worn separately as a pendant or brooch. These stones may be replaced by replica crystal stones. The crown contains eight half arches. Unlike other coronation crowns, it was specially constructed in such a way that its arches could be removed, allowing for the crown to be worn as a circlet. Queen Mary used the crown in circlet form at the coronation of George VI and at State Ceremonies involving her granddaughter, Queen Elizabeth II. Since Queen Mary’s death on 24th March 1953, her consort crown has remained unworn. The crown was regarded as a miracle of construction as it weighed just over 22 oz in all. The Queen Mother’s crown was executed in 1937, to serve in the Coronation of Queen Consort Elizabeth, the wife of George VI. The Queen Mother’s crown was heavily influenced by the crown that was made for her mother-in-law, Queen Mary, in 1911. The crown is based on a circlet worn by Queen Victoria and was worn by HM Queen Elizabeth the Queen Mother at the Coronation in 1937. The band is encrusted with diamonds, and set on it are four alternate cross pattee and fleur-de-lis. The famous Koh-i-Noor diamond is set in the front cross pattee; this echoes the construction of Queen Mary’s Crown. From each cross pattee rises a tapering jewelled half arch. On the intersection is the monde carrying a cross pattee in the centre of which is a large diamond. The arches are detachable and heavily set with diamonds. The frame of the crown is made out of platinum and inside the “Cap of Estate” is made out of purple velvet. The Koh-i-Noor remains in the crown to this day, as does the 17-carat diamond which was given to Queen Victoria in 1856 by the Sultan of Turkey. It is set directly below the Koh-i-Noor on the front band. Both the arches of the crown and the Koh-i-Noor and its mounts are detachable. 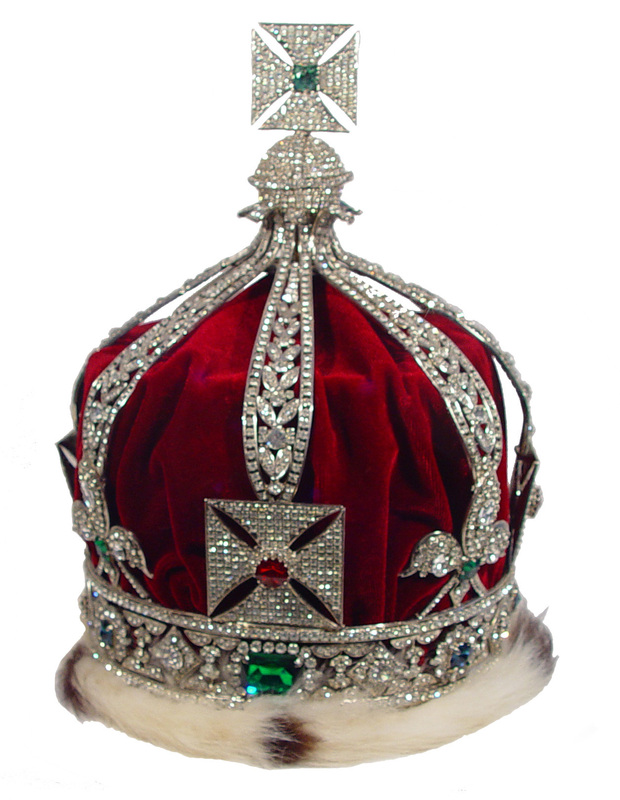 The crown contains 2800 diamonds. The Koh-i-Noor, set into the crown of Queen Elizabeth the Queen Mother, has had a long and bloodthirsty history since its appearance was first recorded in the early years of the 14th century. At that time, it was the property of Sultan Ala-ed-Din, ruler of Delhi from 1295 to 1316. Over the centuries, the stone has been at the centre of a complex web of intrigue, murder, brutality, torture and deception. The stone carried a curse – that misfortune would befall the owner, although any woman wearing it would remain unharmed. This crown, the lightness and elegance of which set it apart from other British crowns, was commissioned by Queen Victoria for her personal use. She found the Imperial State Crown too heavy, and very much resented the complicated procedures involved when removing the crown from the Tower of London. The small crown is a beautiful structure of heraldic Tudor form, which was made at Queen Victoria’s own expense in 1870. It is the crown perhaps most closely associated with Queen Victoria. Such was the association that the crown was placed on her coffin before her funeral. This crown has a touching history. Following the death of her husband, Prince Albert, Queen Victoria withdrew from public life and wore widows weeds until her death in 1901. Government pressure made her return to public life in 1870. Queen Victoria refused to wear the Imperial State Crown partly because it was too heavy, and also because it was impossible to wear her mourning veil. The new small crown was created as a replacement. Because of its size, it could be worn on top of her mourning veil, so meeting the ceremonial needs of the British monarchy as well as her own desired form of dress as a widow. The design of the crown followed the standard designs of British crowns. It is made up of four half arches which meet at a monde, surmounted by a cross. Each half arch runs from the monde down to a cross pattee along the band at the bottom. Between each cross pattee is a fleur-de-lis. The crown does not have an internal cap, as it was set on the Queen’s widow’s cap. The crown is made of silver. It contains 1187 diamonds, which were allowed in mourning, unlike coloured stones. The diamonds all came from a necklace owned by Queen Victoria. Queen Victoria first used the crown at the State Opening of Parliament in Westminster on 9th February 1871. She wore it on all state occasions after that date, whenever she was required to wear a crown. Technically the crown belonged to Queen Victoria herself rather than to the British Crown, and therefore did not form part of the British Crown Jewels. In her will, Queen Victoria left it to the British Crown. In 1937 King George VI ordered that it should be moved from Windsor Castle and added to the Regalia kept in the Tower of London where it remains on show to this day. Height: 9,4 cm, inside diameter at base: 9 cm. The King George IV State Diadem, also known as the Diamond Diadem, forms part of the Crown Jewels. The Diadem was made in 1820 for the coronation of George IV. It was constructed to encircle the velvet “Cap of Estate” which he wore in the procession to Westminster Abbey. The diadem is adorned with 1333 diamonds, weighing a total of 327.75 carats, and has 169 pearls along its base. In between the four crosses it features diamond bouquets of rose, thistle and shamrock, which are the symbols of England, Scotland and Ireland. The four cross pattee set with diamonds represents St. George. The front cross has a rare honey-coloured diamond at the centre. The diamond scrollwork band was remounted for Queen Alexandra in 1902 and is framed between two rows of pearls. The diadem was worn during the coronation procession of Queen Victoria and later Queen Elizabeth II. It is worn by Queen Elizabeth II when travelling to and from the State Opening of Parliament. The diadem, as worn by Queen Victoria (without the cap), appears on the penny black and all her subsequent stamps. The diadem is perfectly circular. Queen Mary’s circlet is taken from Queen Mary’s original crown which was constructed in such a way that the arches could be removed allowing the crown to be worn as a circlet. The crown was first worn on 22nd June, 1911. 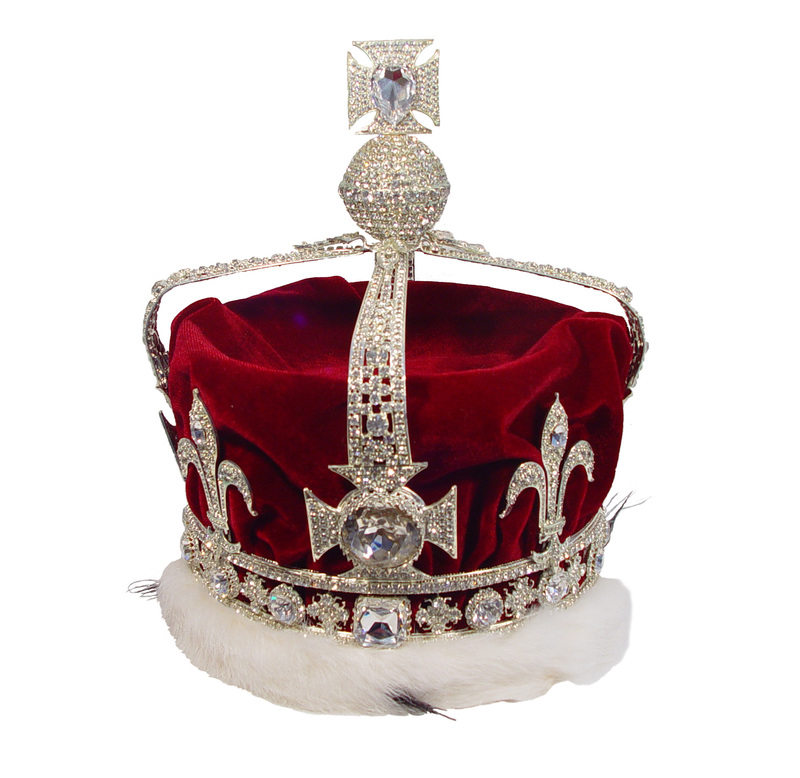 All of our Royal Jewels are hand made, full size crown jewels in replica. Juliette Designs have specialised in all forms of crown jewels for over 25 years. © 2019 Royal Exhibitions. All rights reserved.